Is There Such a Thing as Too Many Chickens? 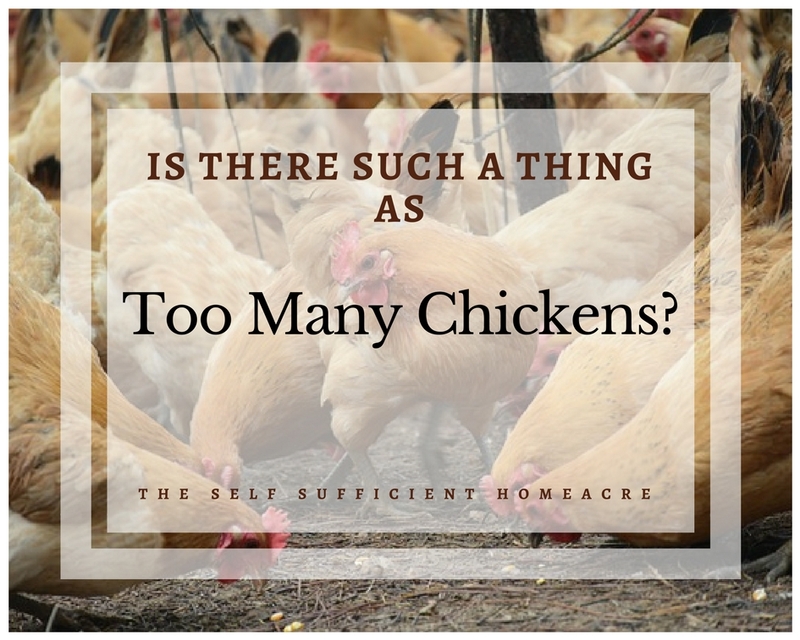 Lisa Lynn May 17, 2015 April 4, 2018 22 Comments on Is There Such a Thing as Too Many Chickens? Do You Have Too Many Chickens? Almost anyone who keeps chickens will tell you that they can be addicting. You start off with a half dozen hens for fresh eggs and before you know it, you’ve got 50+ chickens, ducks, turkeys, and guinea fowl roaming your back yard. Do you have too many chickens? The feed bill keeps going up. There are two incubators full of eggs humming away in your dining room. You want to keep some of just about every breed of poultry because they all sound so interesting. Every time you go to the feed store during spring chick days, you’re tempted to pick up just a few more little fluffballs for your flock. Believe me, I know what it’s like to have too many chickens. This post contains affiliate links for products you may find useful. I make a referral fee or a small commission if you purchase products through these links. Please see disclosure below. If you had told me a couple of years ago that I had too many chickens, turkeys, and ducks, I probably would have scoffed at the suggestion. However, I’m currently recovering from a winter of high feed bills, few eggs, an attack turkey, and the closing of my local feed store. Sigh. How many eggs does your family use? Can you sell the extra eggs at a profit? How much room do you have for your flock? Do you need to purchase all (or most) of their feed? Do you have a source for bedding, feed, and poultry supplies? What will you do with old hens? How much time do you have to care for your flock? Do you use enough eggs to justify a large flock of chickens? Or do you only go through a dozen eggs a week? If a dozen is enough, you will only need a few hens. Depending on the breed and age, a hen may lay an egg almost every day. A half dozen hens will provide more than enough eggs for your family, with extra to sell or share. Of course, you still might find that you have Too Many Eggs! Too many eggs in my fridge. This will depend a lot on where you live, how much you pay for feed, and (naturally) whether you have customers. Do some research. Are there other people selling eggs nearby? How much do they charge per dozen? Ask them some questions…Do they sell out each week? Do they make any money selling eggs? Don’t assume that it will be easy to sell your extras, or that you’ll make enough to pay for the feed (and raising the pullets to laying age, the cost of bedding, medications and other supplies). In some areas you might be the only one selling organic eggs, for example, and you might find your egg business very profitable. In other areas you might be hard pressed to find customers willing to pay more than $1 a dozen. I’m fortunate to have a large pasture and coop for my flock. If you have a small property, you’ll have trouble keeping free range poultry and a nice yard. They’ll eat your garden, poop on your deck, and scratch up your potted plants. This gets old. You’ll be much happier if the flock is pastured in a secure pen that can be moved occasionally. Byron Parker, from the Randall Burkey Company, suggests a minimum of 2 to 3 square feet of space in the coop for each hen (plus roosting space), or 8-10 square feet of space, including their pen. (Check out his article Top 10 Chicken Questions Answered for a fun, and informative, read.) This is a minimum amount of space for each chicken and they’ll enjoy more room to roam. Larger birds such as ducks and turkeys will, of course, need even more space. So before you buy your birds, look at how much room you have to dedicate to your flock. Get your coop and pen ready, prepare for a few extras, and refrain from ordering again until you need replacement chicks. You can save a ton of money on chicken feed if you are able to raise your own grain. However, most chicken keepers need to purchase feed, bedding, and other supplies. Take a look at the prices and availability in your area. Do you have to drive an hour to pick up feed? Does anyone nearby sell straw? Are there any farm supply stores in your area? Doing some research ahead of time could save you money and a headache down the road. At some point your hens will stop producing enough eggs to pay for their keep. I’ve had hens that laid well for 3 years and others that weren’t worth their scratch after the first molt. Will you Cull Your Old Hens and process them for soup? Give them away to someone who will eat them? Or will you feed them through retirement? If you think of your chickens as pets and plan to feed them through their old age, you might want to keep a few less. This kind of support can get pricey, so don’t accumulate more chickens than you can feed and house. Taking care of chickens doesn’t really require a lot of time. However, the larger your flock, the more time you will need to spend caring for them. It can get tiring when you collect and clean several dozen eggs each day, refill water dishes 3 or 4 times, and shovel manure daily. You also need to close the chickens up every night and let them out in the morning if you have predators in your area. This messes up plans to go out to dinner or an event. If you plan to butcher old birds or raise meat birds, you’ll have processing time to add to the mix. It usually takes me somewhere around 20-30 minutes to process 1 bird. On butcher day, I generally try to do at least a half dozen, so it can get time consuming. This doesn’t include the final clean up and freezing, cooking, or canning. This is actually a reduction in numbers from previous years when I had close to 100 birds. Are you interested in purchasing chicken supplies through a buying club? Check to see if Azure Standard delivers to your area. Azure Standard offers Scratch and Peck livestock feed, as well as bulk feed products…delivered to a drop off point. When I cook the young hens I butchered, no matter how Ive cooked them, the meat is tough. Is that just how fresh meat is? Do you let the chickens rest in the refrigerator for 24 to 48 hours before cooking? I can’t claim to know the science behind it, but everything I’ve read says that the meat needs to rest or it will be tough and I have found it to be true. If I leave my bird in the fridge for at least 1 day, it is so much more tender! I hope this helps! We just purchased a small home with 2.25 acres, Thinking of 6 to 8 mixed variety of hens. How many eggs will they produce weekly? Thanks! It will depend a lot on what breeds and their age. If you have 6-8 White Leghorns that are between 5 and 18 months old, you should get nearly an egg every day. 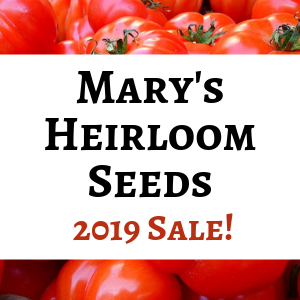 The best laying breeds are White Leghorns and Rhode Island Reds for heritage breeds or Golden Comet, Black Star, or another egg laying hybrid. Thanks for stopping by and best wishes with your future flock! That’s great, Regula! Three sounds like a good number to me right now. 😉 I really need to get the numbers down…yesterday was the beginning of my downsizing efforts. I processed 2 turkeys, 1 duck and 1 chicken. I have 7 roosters to go and later this summer there will be older hens for the stew pot. It makes me sad to do this, but they won’t go to waste. I think it’s great to have meat from happy birds. I would have to learn to butcher. Maybe after my retirement. Until then I know my limits. Have a great time. I have raised chickens for several years, but in the last few I do not let my hens sit on eggs, because when I do they always hatch out roosters, I get very few hens. So you butcher your roosters, do you use them for soup, or are they good baked? Also, how old are they, when you butcher them? That’s interesting…I haven’t had many broody hens actually hatch out eggs, so I haven’t seen that. I usually butcher the roosters between 3 and 4 months old. They are pretty tender, but not much meat at that age. I often boil them and remove the meat from the bones for casseroles, enchilladas, or shredded with bbq sauce. But you can bake or roast them too. A thought just hit me, you were talking about what to do with extra eggs. Do you have any privately funded children’s homes in your area, like Cal Farley’s or Boys town? Put a dollar amount on your eggs and they will probably give you a tax deduction for them. Thanks, Ellen! Yeah, people tend to under-think the whole livestock/pet project. I see chickens for sale on Craigslist and they want like $20 for a 3 year old hen. I know they won’t get that for them and they will have to figure something else out. I’ve taken in old hens too, but they don’t get a retirement plan. I’m glad that you can give a good home to your chickies! How do you cull your flock when the kids know every one by name, even though you told them ahead of time not to get attached. Quote from the dinner table “Was this one Joe? I’m not hungry…” Now we are feeding our chickens until retirement. Uh oh! That’s a tough one, Rebecca. My son is old enough and doesn’t care about naming chickens…so I don’t have that issue. Have you ever raised meat chickens? Maybe raising a few meat chickens, getting the kids involved with processing, and letting them see the cycle of life might help? That sounds like a good idea. I have been thinking I would let the kids hatch out some eggs with the idea that every rooster is for meat, so they should only get attached to the hens. That sounds like a good idea too 😉 Good luck! My children’s reaction to eating their named chickens was, “Wow, [ insert chicken name here] tastes good!! !” The kids were two and five years old the first time we slaughtered our chickens. Now that my son is older (4), he gets a little upset that we slaughter almost all the boys. That’s funny 😉 I can see how he would feel that way. He will probably start to see the economy of keeping mostly just the hens at some point! Best wishes! I find that just sitting outside and watching my chickens is soothing to my soul.